Created by Maserati, a pioneer in luxury Italian car manufacturing, the 1971 Maserati Ghibli Spyder debuted at the 1966 Turin Motor Show with every intent of stealing the show. At the time, this two-seater coupe with a V-8 became the most sought after Maserati vehicle since the 1950’s when the automaker left the racing circuit. It proved its popularity by outselling both the Ferrari Daytona and the Lamborghini Miura. Whether it was the shark inspired nose or the steel body, the car’s design from Giorgetto Giugiaro most certainly turned heads. Internally, the 1971 Maserati Ghibli Spyder was powered by a 330 horsepower V-8 engine that could accelerate to 60 mph in 6.8 seconds and reach a top speed of 154 mph. The car also had two fuel tanks that could be filled from either side of the roof pillars. As for the transmission, the Ghibli spyder came in either a five-speed manual or three-speed automatic. To finish off its classic look, the 1971 Maserati Ghibli Spyder featured sports seats covered in leather, attractive pop-up headlights, and alloy wheels. 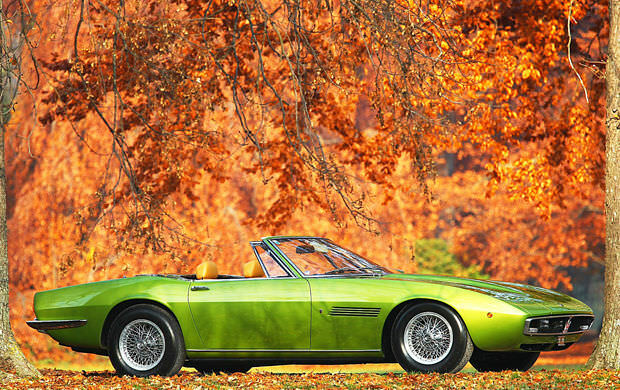 Although it went out of production in 1973, the Ghibli Spyder continues to catch the attention of collectors and those looking to relive their youth.